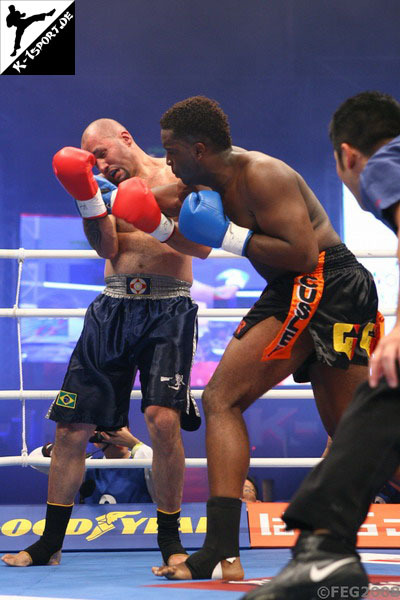 At the time, they boasted world champion Semmy Schilt as well as perennial K1 stalwart Stefan Leko. The day I walked into the gym, there were four other fighters on the mat, little known outside of Holland; Alistair Overeem, Gokhan Saki, Benjey Zimmerman and his cousin, Errol. When we partnered up for drills training, I got a sense of the call/response mode of training known as the Dutch Method. When we began sparring, I was introduced to its effectiveness. I sparred more in a ‘tap tap’ style, whereas those guys sparred at a much higher intensity. This meant that in training they moved the way they fought, which meant they were slower, but generated vastly greater torsional force because of the way they rotated their torso when striking and arranged their limbs to maximise its effect. He kept his spine perfectly straight and extended his legs, jutting out the left rip as he came up. The force of his legs drove the punch as his body twisted, the straightness of his spine functioning as the primary lever around which all the action was organized. The net effect of this was to pop my floating rib all the way out of my body. My liver felt like it had been skewered by a lightning bolt. As I lay on the cold mats, gasping my humiliation and frustration at making such a poor account of myself, I heard someone say, ‘Welcome to Holland.’ And heard the laughter of everybody else. As I write this, I do not regard the elements of his style like pencils scattered across my desk. I see a single moving image, like a film-strip in my mind’s eye, shot through the letterbox of my gloves. It features Errol levering my rib out with that spectacular punch. Errol looked like a Zulu warrior when he fought, animated by the glorious kinetic strength of his postures. Everything was characterised by a straight spine which was driven by the rotation that he summoned from his legs. His head moved up and down as a result of this, which provided the added advantage of making him harder to hit. I was surprised by the lack of technical instruction given by the trainers, Ramon Dekkers and Cor Hemmers. The reason for this was partly because it was the ‘A Class’ training and your technique was expected to be set by the time you got there. However, I believe the main reason is that good technique is contagious. It’s something you catch from others. And the fastest learning curve in the world is the one labelled ‘survival.’ At Golden Glory, you learned, or you were broken, or you quit. I had come from Scida’s gym in Sunshine, which was a tough gym. I knew this because of my experience in Thailand, where I was able to favourably compare myself to people from other countries. Compared to the team at Golden Glory however, I was a powder puff.